>of cargo... mostly our check bags. >after orientation. Our evening meal was midrats. >hard ice runway, right in front of McMurdo station. >who will be working on the IceCube permanent counting house. >after locating the last of our stuff, we started updating DOM Hubs. >Unfortunately (Darryn explained) there is cargo grid-lock for "do not freeze"
>materials we brought with us. >spare Hitachi Deskstar drives we are looking for either. >'which are perfectly fine for DOM testing. >it, given the lack of disks, disk trays, and DOR Rev 1 cards. >Tomorrow, more of the same. >Arthur emailed from ChC. We are looking forward to his arrival. >Tom Geisser, Bill, and I. >complete an upgrade on a DOM. The first one upgraded was the IceTop hub. >hub that Clare, Adam, and Martjn will use for pre-deployment testing. >By the afternoon, Mark, in Madison, was using the hub. >until it was covered with black fabric. It settled down to 3 KHz after that. >The catch-up also came in the afternoon. >got their disk trays, Rev 1 DOR cards, and rudimentary boot checks. >make sense of the rest. >Arthur is on the passenger manifest for arrival tomorrow, 11/25, on schedule. >I exchanged email with him this morning before 9am, then none subsequently. >It's still about -33F here; sometimes the wind kicks up to 14 kts. >Last year a traverse team made it to the edge of the polar plateau. >to pole for reassembly. I guess even that option isn't practical for a D-8. >The cargo most favored for pole-bound trips is fuel, or bulky, or heavy items. >or locate a copy of the Antarctic Sun on-line. See page 11. You'll see why. >That'll be the end of an era. >The two big ones are the science building, and the comms building. >Enjoy your turkey. We get ours Saturday. >Chef James Brown arrived yesterday; he's the replacement for Cookie John. -27F for a while. The wind varies between 8 and 14 kts. Partly cloudy in the morning, and think high clouds now. >after reprogramming the monitor card jumpers, and using a different output. >All five hubs which arrived two days ago in the DNF shipment are upgraded. >There are DOR cards here for 3.5 more hubs, assuming no spares. i.e. >by a collaborator scheduled to arrive soon. >it recognizes the DOR 1 cards, and DOMs with new flash files. >properly, or there is a compatibility problem requiring upgrade of the OS. >Arthur emailed that his flight was cancelled for mechanical reasons. >be Monday (Sunday your time). >problems... Too bad about the delay. >Otherwise, the day hasn't been very eventful. >Just trying to keep to task, and not make mistakes. >were only 16, counting Mark's DOM Test Hub. >Two of the pending hubs are 100% vanilla. We do not anticipate problems. >The spare hub may also be vanilla. >The intermittent hub may be a time sink. We'll see what we can do. >concern about fan failures on the CPU chips, or gigabit ethernet chips. >We have come to appreciate this year how big a failure category fans are. >Around 3:30, the second floor hallway door between the A and B pod closed. >bar (at the end of the galley). >and one tartan kilt in our seating. >water glass, and (institutional) flatware. >with coffee to finish. Our plates were bussed for us too! >civilization is no small feat. >I salute the kitchen staff, and volunteers, that made it possible. James Brown, the new head chef, made our omelettes this morning. >Ham, green pepper, onion, olive, green chili, cheese... and a great cranberry coffee-cake. Sausage patties, and small boiled potatoes too. Orange juice (reconstituted), and a great view of the south pole marker out the window. Another day in paradise. >cables that interconnect the DSB and DOR cards. >I hope Arthur can help us thrash the intermittent hub. >If we can force it to crash, then we will know we are on to something. >The clock fan-outs both work on all outputs. >but, as I said... we have the time to do it. >moving along. They will soon be ready for our timing distribution cables. Subject: Arthur arrived; things are great! > Arthur arrived before lunch, saw the orientation video, and greeted us when we returned to the galley for lunch. Fortunately for us, he felt well enough to walk out to the TOW after lunch... even shunning automated transport!!! Well... actually, we had to reconnect the DOM MB that were disconnected from the filter, and placed in boxes on the shelf yesterday while we were away from the TOW...Perhaps disturbing things set something right. it looks like we have just about achieved our primary mission. There is something I don't understand, though. I've heard that another two DOM hubs will be needed for the acoustic detectors. Only the 'broken' hub, and the DOM test hub remain uninstalled in the TCH. Perhaps additional hubs will be provided for the acoustic system. hmmm. The filter box problem is somewhat alleviated now that we have negotiated a three way deal. We borrow IceTop filters from last season for a while, the DOM Test people borrow short DB-9 cables used with the IceTop filters, and we get to use the IceTop filters with the long DB-9 cables (borrowed from us by the DOM Test crew ) for running MOAT in the counting house. Permissions, and passwords have been arranged so that testing can commence soon. Some of the DOM Hubs in the TCH have their standard data taking softwareload now. They are just about ready for moat... except the new clock fan-out isn't installed yet... and won't be (at least not permanently) until the missing rack arrives. Before the opportunity was lost, Bill and I measured all combinations of pins and shield for string 21 quad 2 using both an ohm meter and a capacitance meter. The measurements are remarkably symmetrical, to better than a half percent. They compare very closely with string 21 quad 3, allowing for the extra cable length increasing the capacitance a little. At the moment, we can't see any smoking guns. We look forward to capturing and examining waveforms from the oscilloscope like sampling feature recently added to both the DOM and DOR firmware. Finally... Bill and I made some timing skew measurements of both of the clock fan-out cards. I now have data on all of the six boards produced so far. It looks like the additional measurements fall into the distribution of the 4 cards previously measured. So... a little progress was made today... > The rumor is that another of our DAQ crates is on the way... We hope it came on one of the two flights today. Three flights tomorrow. We are keeping our fingers crossed. -34.4F, with 7.5kt winds from grid 075 this evening. GPS antenna Encased in a cavity in slabs of foam insulation. The antenna itself is about 4" above the roof. It works!! Beaker-box/IceCube-Lab in the background. This morning, with Arthur's help to write a CPU intensive program, by loading both CPUs of the problem hub to 99.9%, we showed that faulty fans DO result in a system crash of DOM Hub 8. So, we replaced the CPU board, fans and all, with a fresh spare from the cabinet in the TCH. Under the same CPU load, during an hour and a half of running, the hub didn't crash. We feel pretty certain we understand the problem with that hub. (Darryn remarked that the winter-overs should have spotted that one...he said he was pretty disappointed) Darryn promised us some different fans to use with the "faulty CPU board" for a test.If the opportunity presents itself, we'd like to test the old board with functional fans to prove (or disprove) that neither the board itself, nor the (properly cooled) CPU chipsare faulty. It's important to do this because the board we put into the hub was the only complete loaded spare board. The other spare CPU board has neither CPU chips nor fans!!! It's important to leave sufficient spares...apparently including fans. All hubs now have all upgrades. (except the DOM Test hub, which doesn't have a removable drive bay, and is running with a Western Digital disk drive.) That hub, (previously Icehub8), with four DOR Rev 1 cards, is available to DOM testing now. Bill mounted the rack rails from spares provided by Paul W.
Arthur aided Claire, Adam, and Martjn with making sure the right releases of drivers, and firmware were installed on the DOM Test hub. They are now running smoothly with a large number of DOMs... possibly 64. This only partially describes Arthur's work today. 4) started overnight test on icetop hub 1 (initial results look good) with jerry's dom mainboards. More DAQ crates arrived in the afternoon... apparently all the remaining five. Two crates contained new racks. Other equipment cases contained CPUs. The temporary counting house is quite crowded right now, with people installing, and boxes to obstruct the way. To aid Arthur, and to get along a little farther ourselves, the old GPS clock distribution cables and passive fan-out have been removed from the temporary counting house. The new fan-out is temporarily installed to serve the String 21 hub, and the IceTop hub under test. The new racks will have to be properly installed in their final places before we move the GPS clock and fan-out to their assigned locations. One Friday morning at 7am IceCube will be participating in a world wide webcast called "Beyond Einstein". Diamond dust today... The sun-dog displays were fairly persistent today, but not very spectacular any time when we checked on them. There was only a hint of a halo. Temperatures hovering slightly below -30F, but winds below 8 kts. So, as you see... we're a little farther along. >All the hubs are in good working order. >5 hubs have faulty ethernet fans, but don't exhibit performance problems. >Paul Wesniewski asked for a list of those hubs. >parts and procedure become available. >will probably leave pole before the parts arrive. >didn't seek statistics... maybe tomorrow. >Additional DAQ boxes arrived, including crates with the new racks. >Many new CPUs and Uninterruptable power supplies also arrived. >yet... not until all those new racks are moved to their permanent locations. >disrupted Arthur's DOM Hub performance testing. >for them. Cabling, again, has to wait. >over the speaker phone, of the past weeks activities. >It's warmed up, but the wind has picked up. >Wind-chills are still hovering around -50°F. >Meter CMB telescope right next to the DSL. >building codes. It was considered a fire hazard. >around the world. Tom Geisser will do most of the talking in our slot. >wasn't much of a day for news from here. >their final positions. All the replacement 30 A twist-lock power connectors were installed yesterday. So, DOM Hubs, GPS clock and fan-out could all be powered... and were. >to the DOM Hubs. That allowed Arthur to resume testing. >We reconnected String 21 to ichub6. >with a spare from the cabinet. That one did work. >We had enough time today to further investigate the faulty fans. >on one board should fail has a small probability... something like 1%. >label said they were ball-bearing fans! So... why did they die?? >eventually dried out, leaving a gummy residue. >corrupt, instead of always perfect. >testing. Now we can return the 2km filters to IceTop. >Remember, the CERN physics webcast is tomorrow. >questions by waiting the webcast latency time. It got confusing. >channel 0 in that card. >for the 10MHz clock at each the test point of each DSB. >broaden the line. It doesn't. >The span of skews is about 0.75ns. I think we can live with that. >looked particularly bad last year. >Arthur has sassessed the performance of exactly half of the DOM Hubs. >They are ready for strings. >measurements at SPCTS in Madison. No smoking gun there. >The problem in quad 2 must be at the DOM end of the cable. >quad 2 waveforms is running through the night. >Outside, many DOMs were moved today. >I suspect that Claire and Adam have gotten through another batch of DOMs. >equipment is in the racks. >they are in the way a little. >It's warmed up to -17F today. The wind kicked up to 20 kts, though. >A -40 wind chill is the best I've seen so far. >I walked around the DSL today. Many materials for the base are on site. Today Bill composed a two page information transfer document to share with the winter-overs. We hit upon all the difficulties we had this summer, and the helpful information we thought would carry them through the winter. In the afternoon, we invited all there winter-overs to have a chat, rather than dumping the document on them later. The meeting went well. Notes were taken, particularly by Victoria. 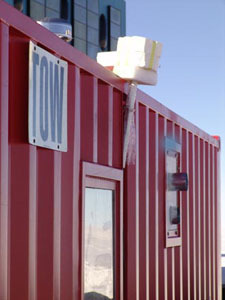 The spare GPS antenna is now removed from the TOW, and relocated to its box atop the electronics cabinet. The third shelf of the locker has most of the DOM Hub spares. Arthur found good values for comm parameters for all of string 21.
waveform streams contain features that suggest ringing on the pulses. The ringing appears to be undersampled (above the nyquist frequency)... Several gigabytes of string 21 communications waveform data will take a while to analyze. Several other break-outs exhibit the ringing symptom. On all quads, including quad 2, the cross-talk is quite small, observed at the DOM end of the cable. The snow drifted a great deal today. The drillers are tough, but even they reacted to the wind, and cold. It's Saturday... They served Pizza. IceCubers were responsible for the dish-washing this evening. It's a concession to our high population here. >and probably departs at about noon. >in a couple of months via vessel. >Today, Paul and Karthik moved in some more new UPS's. >as normal DOM Hubs when talking to DOM Main Boards. No surprises. >pairs, like Q2. There are still demodulation issues. >between DOMs. For the moment, we're a little stumped. >Sixteen or so DOMs are mounted in IceTop tanks now. >for Palmer Station in ChC. >Wind chill around -40F. The snow crunches differently under your boot. >Farshid tended bar in the galley. G&T and Martinis... and good conversation.